Comments Off on Easter Egg Scavenger Hunt Clues and Ideas – How to do a Fun Easter Treasure Hunt! Are you stuck for Easter scavenger hunt ideas? When Easter gets near, kids around the world start to get excited. For most young ones, it is the dreamy idea that they are going to be swimming in chocolate eggs for about a week after this popular holiday. However, many parents want to make it something more, especially as many of the kids will be sitting around consuming a LOT of calories during the Easter holiday. For this reason, they want some active Easter games. This Easter, why not consider running some activities to liven up the holiday. It can make a refreshing change for both the younger members and the more mature folk around (those with a few more years under the belt, but a craving to do something fun still burning strong). 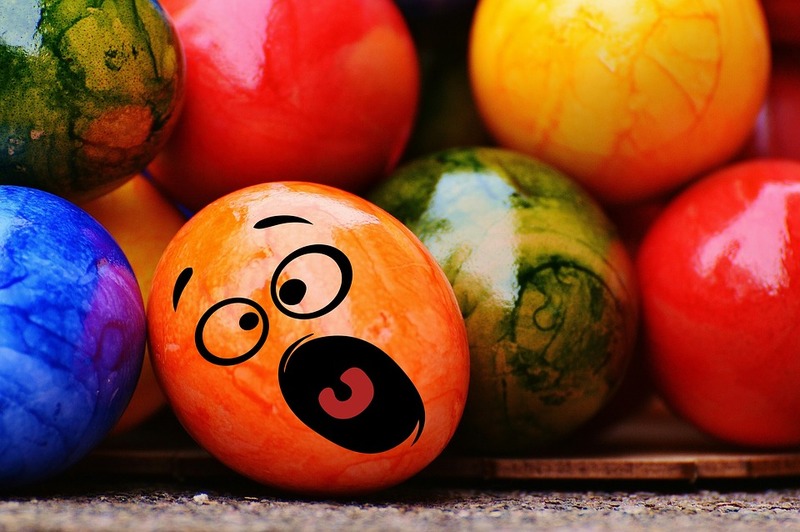 These Easter activities can range from challenges similar to that of the famous TV show ‘Minute to Win it’, crazy scavenger hunts with insane dares, or even educational web fact hunts that are perfect for teaching the real tradition of Easter. There are many ways to run an event, from simple mad dashes for chocolate, to using Easter scavenger hunt riddle clues that challenge teams to think logically, or even setup some photo scavenger hunts where participants must complete tricky photo challenges and present the results to the judges. Whichever you choose, everyone will have a fun day and appreciate that you took the time to organize it. So, this year consider doing something more than just giving Easter eggs and chocolate. Instead, organize an event that everyone will remember. Easter isn’t just about chocolate eggs, it’s about history and about people coming together. Scavenger hunts can make the day far more exciting and actually get everyone talking and moving, instead of just sitting in front of a TV. Not only is it fun, but it can it can also be very easy to organize, as you can simply download professional ready-made riddle Easter egg treasure hunt clues (you can click the blue link for more info, then click the graphic image of the hunt you want). This site linked to above even has a HUGE page of scavenger hunt ideas that it shares completely free to all visitors, along with downloadable scavenger hunt clues for children and adults … in case you don’t want the kids to have all the fun lol. Alternatively, you can search forums and activity sites for ideas, but either way, there are many ways to make a scavenger hunt amazingly fun, even when on a tight budget. After the picnic, the hunt can finally begin. If you do the traditions style, you will need to have hidden all of the eggs previously, in order to make sure they don’t see where you put them. However, for an easier option, gather some Easter scavenger hunt clues and place the items/creatures around the garden/town (you can also just place pictures or models, depending on what is in your garden). When these are setup, the kids must first solve the riddle in their team. Once they know the answer, they whisper it to you and race off to find the item. Once they find the item, they take a photo with them doing a funny pose (mobile photos are perfect) and run back to you to get the next clue and an egg. Then, finally after the last clue, the team to complete it first wins and will be the team with the most eggs (if nobody has ‘swapped’ any eggs). To make it last longer, give a prize for 1st, 2nd, and 3rd place, or even continue for all teams to complete the hunt in their own time, just give the 1st place team something bigger/better than the rest. For older children, a town Easter scavenger hunt can be an exciting day out, as they will literally have to race around the entire town, not just the back garden. All this will make Easter a fun day for everyone! If you are unlucky and the weather is bad, you can also have indoor scavenger hunts. This is then done either online, or in the house. Online scavenger hunts are great, teams need to find the answer to Easter questions and photos of the answer for Easter clues. Although it is not as fun, it can be educational for those involved and they will still want to win the prizes. You can also hide Easter clues around the house and have an indoor Easter scavenger hunt, but you need to keep the numbers of players lower (unless you have a mansion of course). This is still exciting, especially for children. Even adults like it, as they know a ‘treasure’ is waiting at the end lol. To reduce costs even further, you could also expand the event with some pre-event craft activities. This not only helps to take up the day varied, but prolongs the anticipation of the main event, dramatically rising excitement levels for the hunt. Organizing an egg painting day with the kids that will be involved prior to the main event can be a wonderful start to the day. Just get everyone around in the morning and get them to decorate 5-10 beautiful eggs each (hard boiled please, you know what will happen if you don’t!! lol). This will be fun and keep them entertain for a couple of hours. You could even award small prizes to to the most inventive, beautiful, or colorful eggs. While the eggs are drying, consider having an Easter picnic for everyone, especially as this will likely be around lunch time. If you tell the kids in advance, they can bring something each to the day, which means the food will surely be fun and random in nature. However, you could also include a simple cooking class at this point, where the participants can create there own exciting sandwich concoctions. Just be sure to set the rule that they eat what they create, as you will get some extreme sandwiches otherwise, most of which will be left after one bite! Pizzas are also another fun activity, but this does depend a lot on the amount of space you have for preparation and also on your cooking facilities. If you have nice neighbors, maybe a few would let you use their ovens for cooking, especially if their kids are a part of the party ;-). Let’s be honest, a trip to the seaside is a fun experience in itself for children. However, no matter how much fun something is, there is always a way to add to excitement levels. Next time you head to the beach, don’t just look out to sea, instead, look around your feet. Notice how there is so much more than pebbles and sand here? There will be a wealth of different things that have washed up on the beach over time, take shells for example, or even a bit of driftwood. Straight away you already have a fun game to play with your children the next time you head to the beach, say hello to the idea of a Seaside Scavenger Hunt. For the purposes of this article I am going to be presuming that you are planning a kids scavenger hunt. To be honest though, you could ramp up your planning a little and make this more of an ‘grown ups’ game. My feeling is though, the main reason as to why you are going to want to run a scavenger hunt like this is more of an educational experience. Honestly, there is a lot to learn about life at the seaside, especially when it comes to the wildlife. It also provides a great way for children to get a bit of exercise. Honestly, if you come up with some decent scavenger hunt ideas then you will have your children running about all day trying to find various things to put into their bag and bring to you. So what sort of things do you want them to be on the lookout for? Well, I suggest that you should get children looking for shells and various colored stones. Searching for these things always seems to work pretty well, and the children are going to have a nice little souvenir to take home to help them remember their time at the seaside. In addition to this, I suggest that you take the time to allow your seaside scavenger hunt to be a bit more about appreciating the wildlife that you can find at the seaside. One suggestion here though, don’t have them picking up the wildlife themselves. A key part of their education should be that things should be looked at but not touched. I therefore suggest partnering up with your children and carrying around a camera. You can take various photographs of the wildlife they see. Of course, what you are going to be searching for during your little hunt will depend on where you are actually carrying out. For example, some areas may have crabs for you to spot, others may not. Do carry out a bit of research beforehand when trying to come up with your scavenger hunt ideas to be sure that you and your children aren’t going to be running around all day trying to find something which isn’t really there (you have no idea how annoying that is until you find yourself in that position!). I look as this as more of an educational experience than a true game (although it is going to fun!). Therefore your standard scavenger hunt riddles are going to be off the menu here. Instead you I suggest that you look into printing up small snippets of information about the various things that your child will end up finding. This way when they find it, they can learn a little bit more about what they have found! There is plenty of information out there on the internet and thus it shouldn’t be too difficult. Of course, you won’t be able to get information about the pebbles, but you certainly will about shells, wildlife and other things. In fact, you may want to expand beyond the standard ‘nature’ scavenger hunt. Remember, there are a number of other things that we closely associate with the seaside. For example, deck chairs, promenades, ice creams and much more. Try to get your child on the look out for these too! Although of course, don’t make it so intense that they won’t have a chance to swim! I know I said previously that scavenger hunt riddles are out of the question, but this is something that you could always look into if you have older children. There are plenty of websites out there dedicated to riddles so it shouldn’t take too long to find. Remember though, your riddles are most likely going to need to be fairly basic as you don’t really have time to ‘set up’ a scavenger hunt at the beach, for example, you aren’t going to have them rushing from clue to clue. As I mentioned before, this is something that you should look into as an educational experience, especially if you are a teacher taking a couple of kids away on a school trip! A couple of safety tips here. As you know, the beach and the seaside is an incredibly dangerous place for a child to be on their own at any age. Not only do you have to keep an eye out for the dangers of nature, but also of the various types of people that do tend to hang around the beaches. My suggestion is that you stay with your child at all times. You don’t need to help them with the scavenger hunt, in fact, I actively encourage that you don’t. However, never be more than a few metres away from them! Of course, this is just a small snippet of ideas that you can incorporate into your kids scavenger hunt. I admit, you are going to know a lot more about your child than I do, so just choose something for them which you know is going to be fun. This is going to be the best way if you want to ensure a fantastic day out at the seaside. Of course, once they have completed their hunt, don’t forget to reward them with that obligatory seaside ice cream! Comments Off on Easter Scavenger Hunt for the Holidays? Easter is getting near, the kids are on holiday, and you are probably getting pestered with the dreaded phrase ‘I’m bored!’. Easter is a wonderful holiday, and can be a lot of fun. Unfortunately, someone has to organise that fun. This is where our most recent find comes in really handy! On the home page you’ll find menus of clues for all times of the year, and many different places/activities. When you click one of the menu pictures, it takes you to the scavenger hunt clues page, where the event is explained in more detail and the clues can be downloaded. If you purchase a clue pack, then you will get an email with the download link included. If you aren’t the creative type, then the Scavenger Hunt Ideas page will really cure any chance of your players being bored. I warn you now, it takes some reading as the page is huge. However, it is loaded with gameplay ideas and ways to increase competition! You also don’t have to stick with traditional approaches, such as hidding eggs. Best photos could win grand prizes, you could hide chocolate eggs, chocolates, or even toys etc … whatever your friends/family will enjoy the most. Have a wonderful Easter, and if you organise a scavenger hunt, please let us know how you get on!